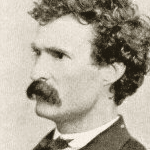 The Call somehow survived the absence of Mark Twain, and its readership continued to rise, almost quadrupling to over 40,000 papers sold in 1880. By 1884 its circulation was twice that of any other daily rag, including its main competition — Michael de Young’s Chronicle and William Randolph Hearst’s Examiner. 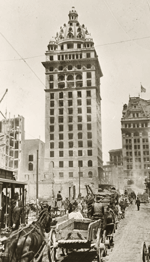 At the turn of the century, the paper was acquired by John D. Spreckels — son of sugar baron Claus — and the Call soon ruled the city from a fabulous new skyscraper at the corner of Third and Market, the heart of “Newspaper Row”. The Spreckels years marked the peak of the Call’s editorial power. In 1913 Michael de Young bought the newspaper and immediately sold it to William Randolph Hearst. Hearst merged the paper with his own Evening Post, and — poaching the crusading anti-corruption editor Fremont Older from another rival — effectively ended the independent life of the conservative morning Call. After a half-century more of mergings and re-combinations, the last vestiges of the newspaper were finally absorbed by the San Francisco Examiner in 1965, and with that, the Call vanishes from San Francisco journalistic history. The “Call Building”, though, is still with us. Though severely damaged by the great earthquake and fire of 1906, somehow this million-dollar monument of steel and Oregon sandstone managed to survive. 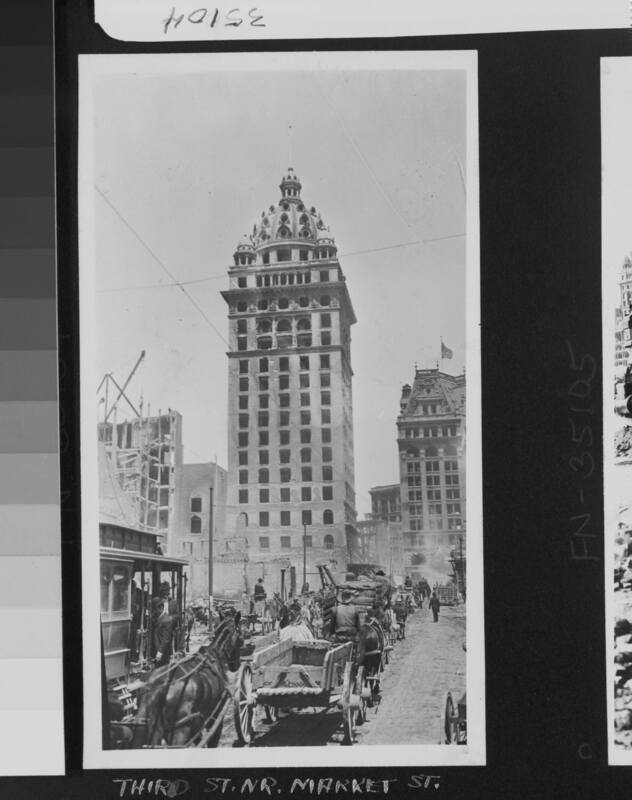 If you ever glance at early-century photos of San Francisco’s downtown, you’ll recognize it by both its height — at 315 feet, for years the tallest building West of the Mississippi — and its outrageous dome, somehow reminiscent of a Prussian military helmet bristling with empty eye sockets. Sadly, that excellent dome was hacked off in 1938 to make room for more office space, and the whole tower was sheathed in an art-deco marble skin. But even though the “Call Building” is unrecognizable now, and it’s official name has become the “Central Tower” — when the wind is right you can hear the faint cry of “Copy!” as you stroll by. Or maybe that’s just me. 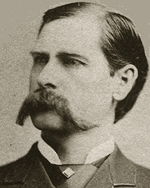 Frontier lawman Wyatt Earp, legendary for his role in the archetypal Western gunfight, “Shoot-out at the O.K. Corral“, is called upon this afternoon to officiate at a $10,000 heavyweight championship boxing match. As he strolls into San Francisco’s Mechanics Pavilion to start work, police confiscate the ex-U.S. Marshall’s six-shooter. “Sailor” Tom Sharkey is the underdog against Australian heavyweight Bob Fitzsimmons, “the Freckled Wonder”. 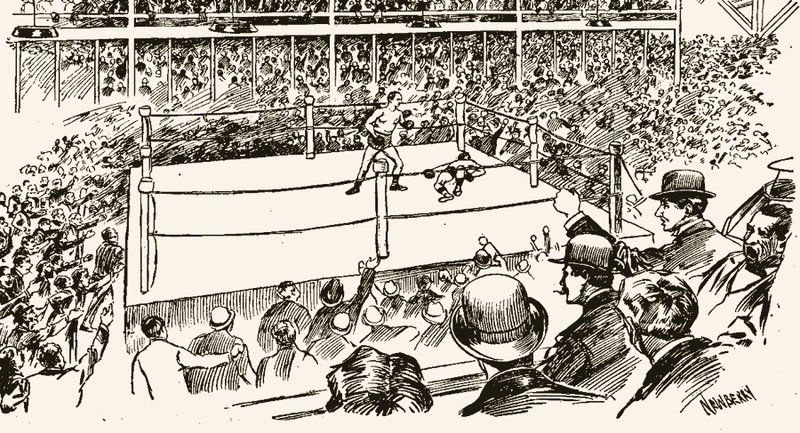 Sure enough, Fitzsimmons knocks Sharkey cold in the eighth — but referee Wyatt Earp calls a foul and awards the decision to Sharkey, lying unconscious on the canvas! 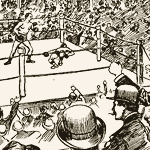 Needless to say, outrage burns in the hearts of 15,000 men present (and the whole city) that the fight had been fixed! The case went before a judge, and though Wyatt was — if not specifically exonerated, at least not found guilty of fraud — he was convicted in the court of public opinion. But what on earth was Wyatt Earp doing in San Francisco standing in a boxing ring in the first place? Well, it’s all because of Josephine Marcus, a nice Jewish girl from San Francisco who’d run off with a traveling Gilbert & Sullivan theater troupe at the age of 18. Passing through Tombstone, Arizona, she’d met the tall, good-lookin’ deputy U.S. Marshall there, and fell in love. After the much-mythologized OK Corral gunfight (you remember, the Earps, Doc Holliday, the Clanton brothers) Wyatt Earp and Josie left Tombstone and wandered all around the West, settling down wherever a boomtown cropped up — investing in mines, racing horses, running saloons and gambling parlors — and south of the border, Wyatt had begun trading on his rough and ready lawman image by officiating at Mexican boxing matches. Sometime in the late 1890s, the Earps wound up living with Josie’s parents back in San Francisco — and there you have it. 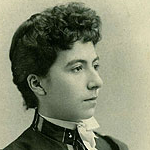 We may never know exactly how Wyatt got mixed in the Sharkey-Fitzsimmons boxing boondoggle, or what his involvement truly was — but in the aftermath of the scandal, the Earps left San Francisco, eventually settling down in Los Angeles. Wyatt wouldn’t return to the Bay Area until his death in 1929, when his ashes were buried in Colma, in his wife Josie’s family plot.